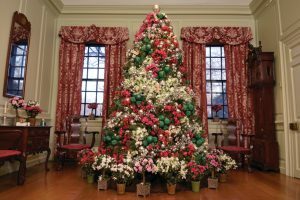 Yuletide at Winterthur embraces the warmth and festivity of the season with a magnificent holiday tour of Henry Francis du Pont’s mansion as well as breathtaking trees, dazzling room displays, a magical dollhouse, and featuring some 60 varieties of flowers. 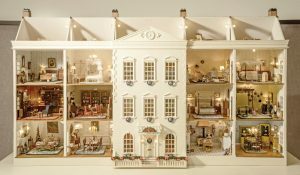 The du Pont’s home will be decked out in holiday style with traditions from history and the du Pont family, displayed along with new inspirations from the outdoor Follies exhibition as well the Dining By Design indoor exhibition. You won’t want to miss the signature displays including the majestic dried-flower tree in the Conservatory or the delightful 18-room dollhouse mansion, filled with nearly 1,000 miniatures and fully decorated for Christmas in the Galleries and a display of antique Santas and figures of the mischievous Belsnickel, a gift giver from German folklore who is closely related to Ol’ Saint Nick. Each delightful room on this year’s Yuletide Tour tells a story reflecting the ways in which Americans have celebrated the winter holiday season from the 1800s to the present. 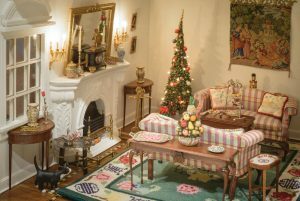 Other decorations and displays reminiscence of H. F. du Pont’s family traditions during Christmas and New Year’s at Winterthur—including the family Christmas tree, glittering with glass ornaments and fringed by baskets brimming with gifts, one for each family member. 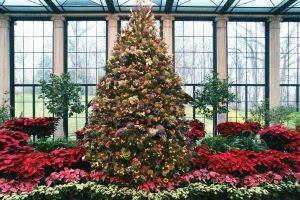 Yuletide at Winterthur has something for everyone to enjoy. 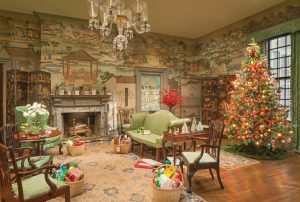 Kids of all ages will delight in a magical Christmas experience at Winterthur Museum, Garden & Library. Times: Tues–Sun, 10am–5pm -Last house tour tickets sold at 3:15pm. This entry was posted in Articulture, Arts and Crafts, Culture, Delaware, Entertainment, exhibition, Fun, History, Kids, Museum, Nature, Special Event and tagged 1800, American, antique, basket, Belsnickel, Christmas, Christmas tree, conservatory, decorated, Delaware, Dining By Design, display, dollhouse, dried-flower, du Pont, exhibition, family, festivity, figure, flower, folklore, Follies, gallery, garden, German, gift, gift giver, Henry Francis du Pont, History, holiday, holiday season, indoor, kids, library, magical, mansion, miniature, Museum, New Year, ornament, outdoor, present, room, Saint Nick, santa, season, signature, story, tour, tradition, tree, Wilmington, winter, Winterthur, yuletide, Yuletide at Winterthur. Bookmark the permalink.